When you want roofing in Richardson, TX for an affordable cost, do you know who to call? ECO Commercial Roofing can assist you with each of your roofing service requirements, so shoot us a call at (833) 200-0571. Customer service is a primary goal of ours, and we can provide you with almost any type of roof assistance you might need. We are participating members of our communities, and we have been dependable Richardson roofers for a long time now. Our roofers are very knowledgeable on the various types of roofing, and we are happy to assist you with any of your roofing questions or concerns. 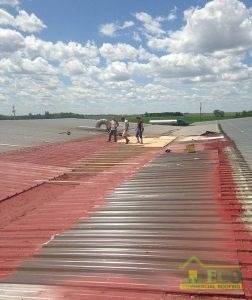 The experts at ECO Commercial Roofing are here to assist you with any of your roofing needs. Your roof plays a significant part in protecting your house, so it is of the greatest importance that you have a contractor you can rely on. Each of our contractors undergoes training to industry standards, and we are sure to only purchase top quality products from brands like Conklin. Since the type of roof you choose can affect the value of your building in years to come, we are sure to carry large selections of materials as well as styles for you to choose from. Everyone likes a particularly stylish roof, but make sure to consider all of the long term perks involved, as well. Your choice should also go along with the type of roof you’ll be protecting, and your set budget for roofing. We have plenty of reliable options to pick from. We supply dependable roof repairs, roof replacements, and roof installations as well. Our expertise allows us to work with any kind of roof, including business, industrial, and residential too. Primarily catered towards flat roofs or low slope roofs, our commercial offerings are the ideal choice for many business owners. Flat roofs can be a bit tricky, and without expert installation, you may be stuck with leaks or ponding. Industrial roofs, though similar to commercial roofs, actually need stronger materials, as well as extremely skilled installation to guarantee longevity. You can even depend on us for affordable residential roofing services, designed to serve your home in a variety of styles. Every roofing company has a specialty, and ours is roofing restoration and roof coatings. In our expertise, using high quality materials like Conklin can truly mean the difference between a roof coating that lasts, and one that does not. Our roofing services are designed to be some of the best roofing in Richardson, TX, with detailed craftsmanship, and impressive customer satisfaction. If you’re interested in discovering additional information about how roof restoration with Conklin products can extend the life of your roof system, give us a ring now at (833) 200-0571, or check out the links provided! As specialists, we typically recommend roof restoration to our clients as a technique for repairing your roof and defending it from additional damages. Using Conklin roof coatings, our crew of professionals can provide an additional decade to the life of your roof! Save both time and money by choosing a reliable roof restoration instead of a roof replacement. The primary method of roof restoration relies on high quality Conklin roof coatings. Such coatings are available in a selection of different materials, and we’re able to help you figure out which one will work ideally for your requirements. The type of roof coating you require will rely on the make of your original roof, in addition to the issues your roof faces most often. Typically, we can also apply the roof coating without taking off your previous roofing material. To discover if your roof is eligible for our roof coating, contact us now at (833) 200-0571! Acrylic Roofing Alternating temperatures require reliable roof coatings such as acrylic, which are quite flexible. Elastomeric Roofing Elastomeric roof coatings are available in a variety of kinds, and are an affordable way to defend your roof. Among the many kinds of commercial roofs we can provide, are low slope roofs along with flat roofs. Bear in mind that your first line of defense against leaks or premature roof failure is a dependable and expert installation. If you are searching for a flat roof solution that will last for years, you have come to the ideal place. 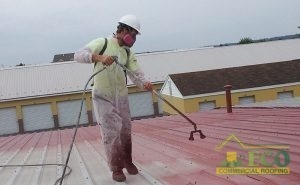 Residential and commercial roof services from ECO Commercial Roofing are reliable and affordable. You can find our expert services and dependable roofing in Richardson, TX, along with in the surrounding cities. Any building can hope to gain from the application of a high quality roofing investment. To find out how we can help you best, give us a call at (833) 200-0571 and schedule your professional roof assessment today!